The rumor stating a DVR function was coming to Xbox One was confirmed by Microsoft at gamecom 2015 this morning. Today, onstage at gamescom, the company revealed the “most requested” live TV feature through Xbox Feedback. DVR for Over-the-Air TV allows users to record live TV, schedule recordings and even take their “shows on the road.” Note, that “over-the-air” is your typical TV channel, so you won’t be able to record shows through your cable or satellite service – even if your console is plugged into your setup. One an Xbox One is set up for over-the-air TV, plug a USB hard drive into the console and start recording content. By recording content to an external drive, there’s no impact on gameplay activities or ability to save to the console. The amount of TV able to be recorded is only limited by the size of the hard drive plugged into the console. 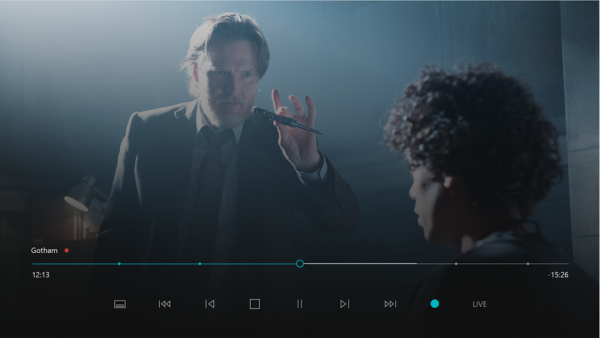 Users will be able to watch recorded shows from the console, stream recorded TV shows to other devices through the Xbox app on Windows 10, or through Xbox SmartGlass for iOS and Android. The shows can also be downloaded to Windows 10 phone, PC or tablet and watched without an internet connection. Recordings can be scheduled while away from the console using the Xbox app on Windows 10 devices or with Xbox SmartGlass. DVR for Over-the-Air TV will be a subscription-free service coming in 2016. More information on the feature can be found through Xbox Wire.